Tired of wearing your t-shirt as it is? This is a new way on how to revamp your simple tee into a striking top! It will just take a couple of minutes to do! STEP 1: Before we start cutting our shirt, we first measured. Measure the length and width of the hull and just think how many strips you want to cut. 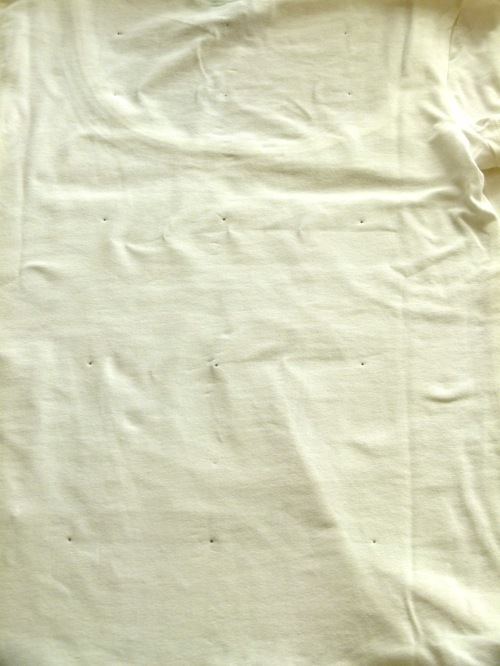 STEP 2: My shirt was 55 cm long and I wanted 5 strips, every 11 cm so I put a dot down so I knew where I had to cut. STEP 3: Decide how long you want each strip. Turn left and then right a point, so you know how far you can cut! STEP 4: Fold your shirt in half and start cutting. Please make sure the front you do not cut it! STEP 5: If you've cut, you do not scare if it is not as straight cut. Stretch the tip a bit, this ensures that the cut edges a little curl, now you see not that it's a bit crooked cut. STEP 6: Take a thin ribbon (I have the piece of ribbon from my shirt which cut it in the store on a hanger is hung) and put a loose knot. Now take the ribbon that you will use as decoration. Roll it to the cut strip and determine how long it should be. Cut and sew the ribbon onto each other. STEP 7: After you have sewn the ribbon, turn the sewn part to back so the pretty side is visible. Sew the ribbon now onto the shirt. Repeat these steps. Tada! You have turned your boring plain shirt into a striking top! So easy right? All photos are not mine. Credits to the respective owner. wow! very good idea! I'll try this on my t-shirt! I love it! good job! Wow! That's great, thanks for sharing! This is the best DIY Ever! thank youuuu!!! I will definitely try it!!! What a great idea! ;P I'll try it one of these days! I'll try your cool idea! OMG! I am so going to do this!!! This is F-ing fantastic! Trying it this weekend! WOW! You did a great job! I also want to make such shirt! wow i love this diy tutorial, i might be doing it for myself as well! i have a new post on my blog so come check it out! and im following you now! Hello beautiful, the back of the shirt is beautiful, great!!! hi girl!!! it looked wonderful!! I did the same diy for my blog 'cause my blog is about diy too :) I follow you now 'cause you have a great idea!! will you follow me? kisses and have a happy weekend! that is so tricky yet simple. I just may have to try that for a gift for my daughters. I haven't the nice body for it, now days... I'm pushing 60 and my body doesn't lie. hahahaha. This is just lovely! Thank you so much for sharing! I have always wanted a tee like this I will definitely be trying this DIY! That's really great idea! Thanks for shearing! Great DIY! I love your blog :D Wanna follow eachother? I will try this one very soon! Maybe on different color! Thanks for sharing this. I am now following you! This is really a great idea that I should try out! Girl, you're soooooo talented !! I love the shirt ! Would try it out one day !